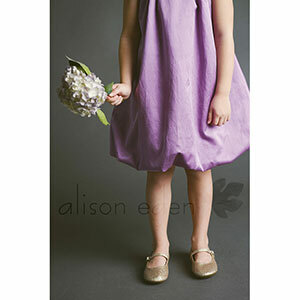 This adorable dress will make your precious girl the belle of the ball. Or mix it up with a fun print fabric for more casual wear. Like all Blank Slate Patterns, the customization is up to you! This confident beginner pattern features: Yoked neckline construction, pleats in the front and back, back zipper and is fully lined (except sleeves). Sizes 12 months through 8 years (yes, you read that right – this is the only Blank Slate so far to come in size 12m!) 12 pages of sewing instructions including color photographs. 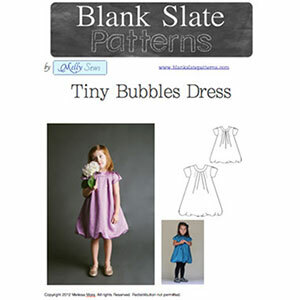 25 pages of pattern pieces that are taped together to form the full-size pattern (all sizes are nested onto one set of printouts) All Blank Slate Patterns print on both 8.5X11″ paper and A4 size paper and include both customary and metric measurements. Suggested fabrics are mid weight jersey knits or any of our specialty wovens. 1 2/3 yards maximum for the lining.